In march 2018, ISO 45001:2018 that replaces BS OHSAS 18001:2007 was issued. 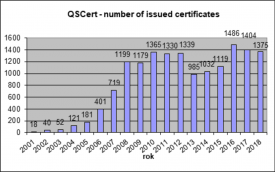 QSCert® is independent Certification Body with the international operation. Its main operation subject is certification of management systems (quality, environment, occupational health and safety protection, information security, food safety, NATO suppliers, etc.) and provision of other services.